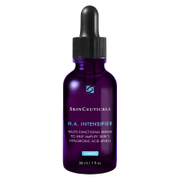 Combining at-home laser technology with SkinCeuticals potent antioxidants! This comprehensive at-home system partners the Age-Defying Laser with SkinCeuticals state-of-the-art topical antioxidants for improvement in visible signs of aging such as fine lines, wrinkles, and elasticity. The Age-Defying Laser + Antioxidant System can be used in conjunction with in-office professional laser treatments as at-home maintenance. Tria Age-Defying Laser: At-home laser to restore your skin's luminosity for a more youthful, radiant, and refreshed look. Post-laser antioxidant regimen: C E Ferulic and Resveratrol B E provide comprehensive protection against environmental aggressors caused by free radicals and help support your skin's natural repair. This antioxidant duo is proven to replenish post-laser skin and improve visible signs of aging. Ideal for dry and normal aging skin types. Cleanse your skin with SkinCeuticals Simply Clean. Treat skin with Tria Age-Defying Laser. 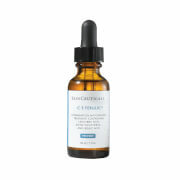 Calm skin with SkinCeuticals C E Ferulic. 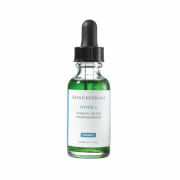 Soothe and promote skin's natural repair with SkinCeuticals Resveratrol B E.
For detailed directions, please read the included instructions. Perform at nighttime, 5 days a week for a 12 week period. Treatment may be resumed after 4 weeks. During this 4 week resting period continue to apply C E Ferulic in the morning and Resveratrol B E in the evening for long-lasting results. Tria Age-Defying Laser: At-home skincare, the Age-Defying Laser is the only FDA-cleared at-home technology currently available for use on your entire face. 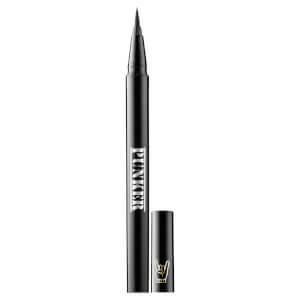 It's safe to use on the forehead, cheeks and around the eyes. SkinCeuticals C E Ferulic: A synergistic antioxidant combination of 15% L-ascorbic acid (vitamin C), 1% alpha tocopherol (vitamin E), and 0.5% ferulic acid neutralizes damaging free radicals and protects against. SkinCeuticals Resveratrol B E: An antioxidant night concentrate with a maximized concentration of 1% pure, stable resveratrol, 0.5% baicalin, and 1% alpha tocopherol (vitamin E) supports your skin's natural antioxidant defenses. SkinCeuticals C E Ferulic: Water, Ethoxydiglycol, L-ascorbic Acid, Propylene Glycol, Glycerin, Laureth-23, Alpha Tocopherol, Phenoxyethanol, Triethanolamine, Ferulic Acid, Panthenol, Sodium Hyaluronate. SkinCeuticals Resveratrol B E: Aqua / Water / Eau, Dimethicone, Propylene Glycol, Dipropylene Glycol, Niacinamide, Alcohol Denat., Glycerin, Caffeine, Sodium Chloride, Peg/ppg-18/18 Dimethicone, Tocopherol, Resveratrol, Scutellaria Baicalensis Extract / Scutellaria Baicalensis Root Extract, Disodium Edta.